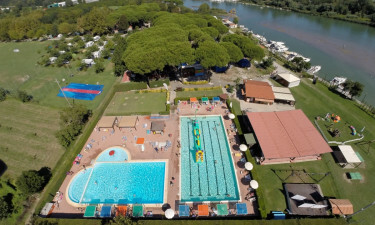 A gateway to discover the natural beauty of Liguria, Camping River in Ameglia offers a luxury camping experience with comfortable accommodation. The full-service campground has all the comforts of home, whether you are travelling with family or friends. 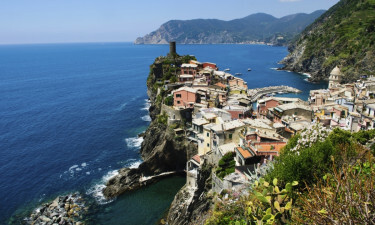 A short drive from the scenic coastline of the Ligurian Sea, this luxury camping site is on the banks of the Magra river. Spacious pitches are easily accessible off the A12 motorway. Book your unforgettable camping holiday today with LuxCamp! Your mobile home will be surrounded by lush greenery, a beautiful setting for you to experience the outdoors. Berths at the campground’s dock are also available, and the dock is also a launching point for tours of the river. There are superb services, including a restaurant and bar with a delicious menu and a market selling essentials. Outdoor swimming pools offer you an inviting spot to cool down during hot days. There are comfortable chairs along the side of the pools. You can also relax in shady areas under maple trees at the campground’s lovely Tuscan inspired garden. 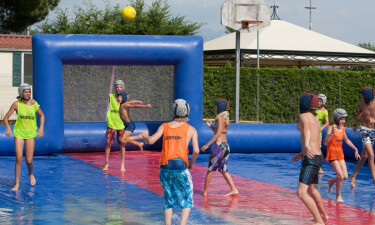 Along with two large swimming pools, the campground’s pool area has a shallow section just for younger campers. Little children will love splashing and playing under cascading water. A covered dining area and the holiday camping site’s restaurant are also adjacent to the attractive pool area.